Used Kia OPTIMA for Sale in Kansas City. 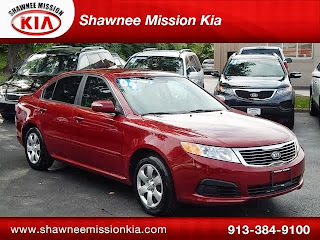 Shawnee Mission Kia would love to help you make this Used 2009 Kia OPTIMA your own! Don't let this Kia OPTIMA get away! Your Used 2009 Kia OPTIMA has only 59357 miles as well as 5 SPEED, AIR CONDITIONING, AM/FM RADIO, ANALOG GAUGES, ANTI-LOCK BRAKES, BUCKET SEATS, CHILD PROOF LOCKS, COMPACT DISC PLAYER, CRUISE CONTROL, DRIVER'S SIDE AIR BAG, FOLD DOWN REAR SEAT, INTERMITTENT WIPERS, MANUAL TRANSMISSION, MAP LIGHT, PASSENGER SIDE AIR BAG, POWER DOOR LOCKS, POWER MIRRORS, POWER STEERING, POWER WINDOWS, REAR AIR BAG, REAR WINDOW DEFROSTER, SIDE AIR BAG, TILT STEERING WHEEL, TRACTION CONTROL, TRIP ODOMETER, CLOTH SEATS. Used Kia FORTE for Sale in Kansas City. 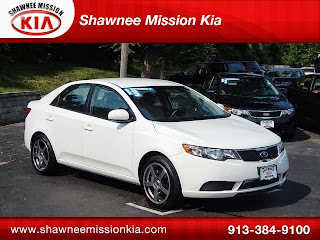 Shawnee Mission Kia would love to help you make this Used 2013 Kia FORTE your own! Don't let this Kia FORTE get away! Your Used 2013 Kia FORTE has only 23647 miles as well as 6 SPEED, AIR CONDITIONING, AM/FM RADIO, ANALOG GAUGES, ANTI-LOCK BRAKES, BUCKET SEATS, CHILD PROOF LOCKS, CLOTH SEATS, COMPACT DISC PLAYER, DRIVER'S SIDE AIR BAG, FOLD DOWN REAR SEAT, INTERMITTENT WIPERS, MANUAL TRANSMISSION, PASSENGER SIDE AIR BAG, POWER STEERING, REAR AIR BAG, REAR WINDOW DEFROSTER, SIDE AIR BAG, TILT STEERING WHEEL, TRACTION CONTROL, TRIP ODOMETER, ALLOY WHEELS.